The former Party Secretary of Tibet Autonomous Region, Chen Quanguao (left) with the newly appointed Party Secretary Wu Yingjie (right). 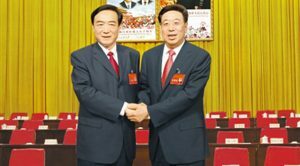 On August 28, 2016 the Chinese authorities replaced the Party Secretary of the Tibet Autonomous Region, Chen Quanguo, with Wu Yingjie. Chen’s transfer may not have any extra significance as he has served in Lhasa for over five years, which is around the time when such Party officials are moved. But Wu is interesting in quite a few ways. Wu is the first of the “second generation Tibetans” (Chinese: Zang Er Dai) to assume the position of the Party Secretary. The term “second generation Tibetans” is assigned to Chinese officials who have literally grown up in Tibet, having been brought there by their parents when they were young. They are believed to be very familiar with the Tibetan way of life. The first generation is composed of those who were sent in the 1950s by Beijing after taking control of Tibet. The general assumption is that given his past portfolio and his statements and actions while serving in different capacities in Lhasa and other places, he will only strengthen the Party’s rigid control of the Tibetan people. 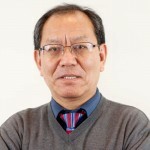 He has been personally linked to some of the crackdowns in Tibet, including in Driru county where he is said to have asked the armed police force, after an incident in 2013, to “further strengthen patrol duty, control and grid management.” According to this theory, Wu Yingjie’s long stint in different Tibetan towns enables him to understand the Tibetan psyche and this will enable him to adopt appropriate stringent measures to deal with the people. In other words, since he is familiar with the Tibetans, he can be relied on to have contempt for them. Wu’s appointment is an indication of the Chinese authorities’ inability to empower Tibetans to assume such a responsible position. In the past, when asked why a Tibetan has not been appointed as a Party Secretary, one of the responses from the Chinese side has been that, unlike in the government, in the Party there is no space for ethnic consideration. But in the present case, Pema Thinley (Chinese: Padma Choling), holds a deputy secretary position (a rank similar to that of Wu Yingjie before his promotion) in the Tibet Autonomous Region Party Committee. In fact, Pema Thinley is senior because he became Deputy Secretary in 2010 while Wu Yingjie was named Deputy Secretary only in 2011. So Pema Thinley’s seniority in the Party should have made him an equal candidate for the post. But there is no indication that anything like that has happened. Thus, his being a Tibetan might have in fact been an obstacle in his promotion, just as it seemed to have been with previous Tibetan Party leaders like Bapa Phuntsok Wangyal, Sangye Yeshi (Tian Bao), Tashi Wangchuk, etc. 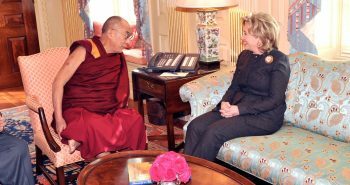 The only message that one can take from this is that if one is Tibetan one is always a suspect in the eyes of the Chinese Communist Party. That was the situation in the 1950s and it remains the same today. I want to mention here that I am of the view that even if a Tibetan were to be appointed as the Party Secretary, he or she would not be able to do much, in the absence of courage to take a certain amount of risk. For the possibility of being accused of “local nationalism” will always be there, like the Sword of Damocles. Nevertheless, whenever, there is a change in leaders, there is always the possibility of a new approach. Therefore, there is the opportunity for Wu Yingjie to show himself as someone sensitive to the Tibetan people’s sentiments. In this he does not have to look far for inspiration. There is his namesake predecessor, Wu Jinghua, who served as the Party Secretary in Lhasa from 1985 to 1988. This Wu, who was of Yi nationality, endeared himself to the Tibetans by his willingness to appreciate Tibetan sensitivity, allowing for the revival of Tibetan culture and tradition, so much so that the 10th Panchen Lama is said to have termed him even as ‘one of the best officials in Tibet’. Even if we look at history, it looks like Mao Zedong himself did look for officials who did not alienate the Tibetans. It is believed that Zhang Guohua, who served twice as Party Secretary in Lhasa (in the 1950s and in the 1960s), is said to have been chosen for his familiarity with the Tibetan culture. Today, despite whatever claims the Chinese authorities might have about how wonderful the life of Tibetans in Tibet is, the fact remains that there is a trust deficit situation. By their misguided policies, recent Chinese officials overseeing Tibetan affairs have not contributed to reducing this deficit. If Wu Yingjie truly considers himself a “second generation Tibetan” he should understand Tibetan aspirations and reflect that in his work. Next postWhy does Tibet matter in the discourse on the democratization of China? Not mentioned are perhaps the two most important reasons Pema Thinley should have had an edge over Wu Yingjie . . . at least on paper. Pema Thinley was and is a full member of the Party Central Committee in Beijing while Wu Yingjie was only a delegate from Tibet to the 12th Party Congress that elected the Central Committee. Not only did he not make it onto the Central Committee, he also did not make the cut for Alternate Member of the Central Committee. Secondly Party seniority is always a factor in promotions. Pema Thinley joined the Communist Party while he was serving in the military in 1970. Wu Yingjie became a Party member in 1987, an astonishing 17 years later when he was 36 years old and rather long-in-the-tooth for an entry level neophyte. Perhaps someday an explanation will emerge that explains why it took so very long for this “second generation” cadre in Tibet to find a home in the Party. 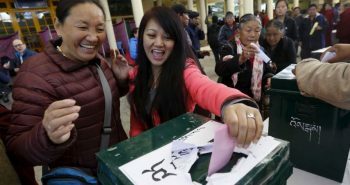 In the end, however, if discrimination did not completely seal the selection decision over who would not become Party Secretary, Pema Thinley’s age would certainly have ruled him out. He is 65 years old, and no provincial level Party Secretary in China today can start his/her tenure at such an advanced age. Looking back in time, Sherab Dondrub (Yang Dongsheng), Sangye Yeshi (Tian Bao), Basang, Dorje Tsedan, Raidi，Gyaltsen Norbu，Danzen and Legqok at one time or another all held positions equivalent to Deputy Party Secretary of the TAR Standing Committee, but Phuntsok Wangyal and Tashi Wangchuk never came close. Probably only Raidi ever stood a fighting chance of making the big jump to the highest level, but historically speaking he came along 25 years too early.